I’ve always wanted to go to Harper’s Ferry, not because I’m much of a Civil War buff, but because there’s been a persistent family tradition that the Robert Harper of Harper’s Ferry was related to the Harpers of New York and Ohio that are my ancestors. From what I can tell, it’s completely false. I don’t think we are even cousins — unless the cousinship (is that a word?) started back in Ireland prior to 1700. Unlikely. However, the fact that I’m not actually related to the Harper of Harper’s Ferry didn’t negate the fact that the place has a very interesting history, especially before and during the Civil War. Harper’s Ferry (the town and surrounding area) was key to both the north and south sides. It was also home to one of two US arsenals. During the Civil War there were numerous battles fought there, and the town of Harper’s Ferry changed hands and sides 5 times during the war. The National Park there is very well put together, with lots of interpretive signs, displays and exhibits. We went through the Civil War Museum, Robert Harper House, John Brown exhibition, saw the foundations of the first aresenal, listened to a presentation on the battles fought there, and looked off the point where you can stand in West Virginia, and see Maryland across the Potomac River and Virginia across the Shenandoa River. We also had lunch. Unfortunately, I forgot my camera in my other pocketbook, and Jere’s camera only had 10% charge … so no pictures. They didn’t even have any good post cards that I could photograph! At first we thought we’d spend the whole day there, but it was really hot and we ended up finished in time to make it to Gettysburg, so off we went. 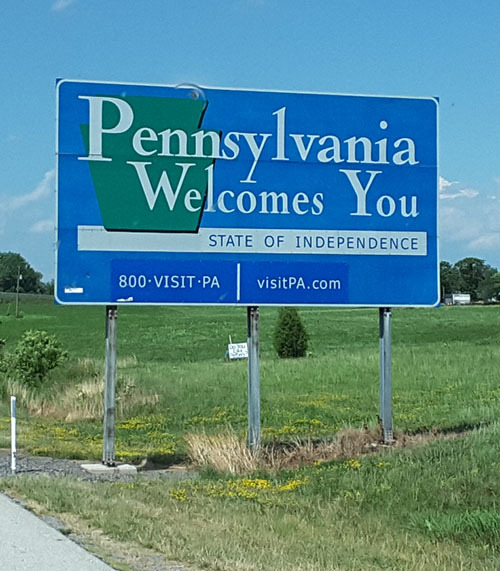 Back through Maryland and into Pennsylvania. We arrived at Gettysburg around 4 pm. We were fortunate (or unfortunate, depending on how you look at it) that the battles at Gettysburg were fought on July 1 – 3, 1863, so this weekend was filled with reenactments and special stuff. The park was also jam-packed with people, but they were starting to leave when we arrived. Jere has become more and more interested in the Civil War. 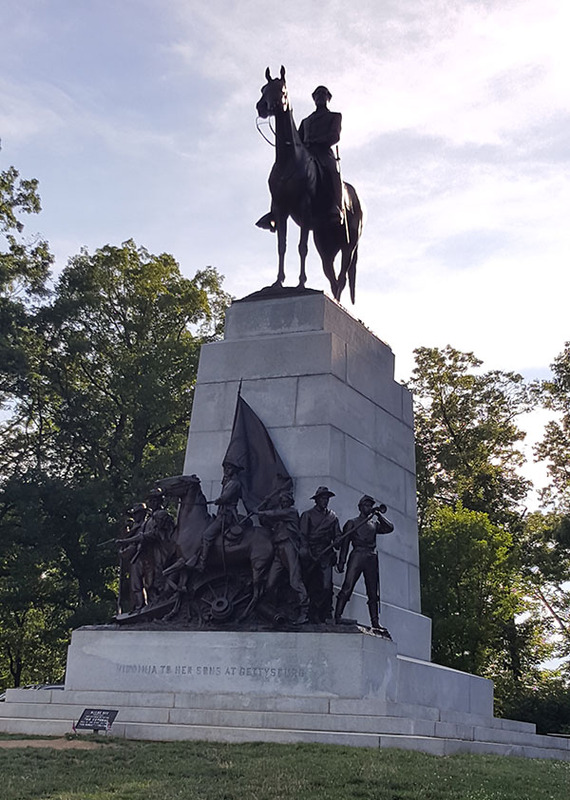 During our last trip through Maryland, Virginia and Pennsylvania we just couldn’t make the route work to hit Gettysburg, so it was a very nice to find that it was right on our route this time. He was thrilled to get an opportunity to see it. However, as mentioned above, I am not a Civil War buff. I knew enough about Gettysburg to know that a major Civil War battle was fought there and the President Lincoln gave a famous “Gettysburg” speech. But honestly, I didn’t really “get” the importance it in the larger scheme of the Civil War and Lincoln’s actions as President. After watching the movie (excellent and narrated by Morgan Freeman), seeing the “Cyclorama” (a huge 360 degree oil paining), looking at the artifacts on display, and going on the auto tour of the battlefields … I was more than impressed. Honestly, I think every American should go there, learn about the events that transpired, and get an understanding of how they affected our nation then … and how they are affecting it now. It was not a simple matter (before, during or after the Civil War) and it’s still not a simple matter. The history of the Civil War has been so simplified in school textbooks over the last 100 years, that much of the important parts have been lost. Yes, it was about freeing the slaves, but it was about so much more as well. 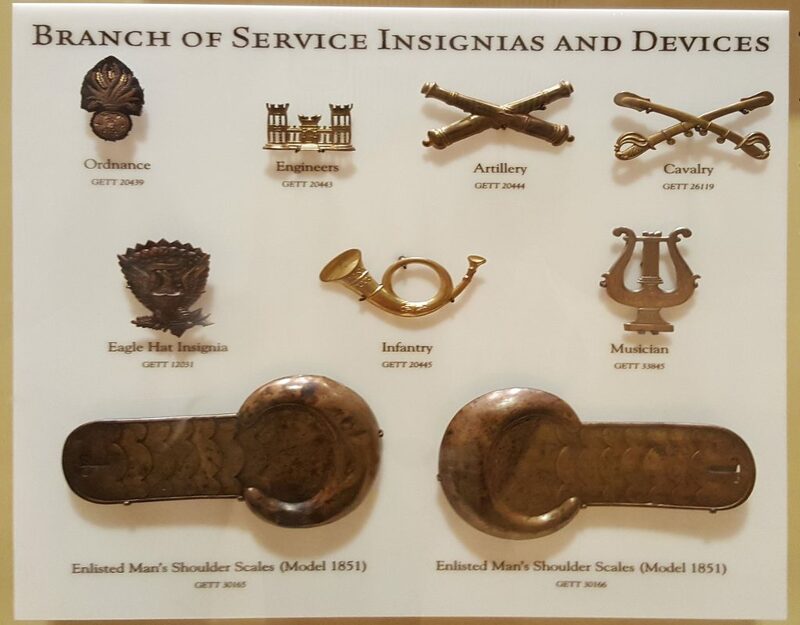 Various insignia of the different branches of service at Gettysburg. Part of the artifacts on display. 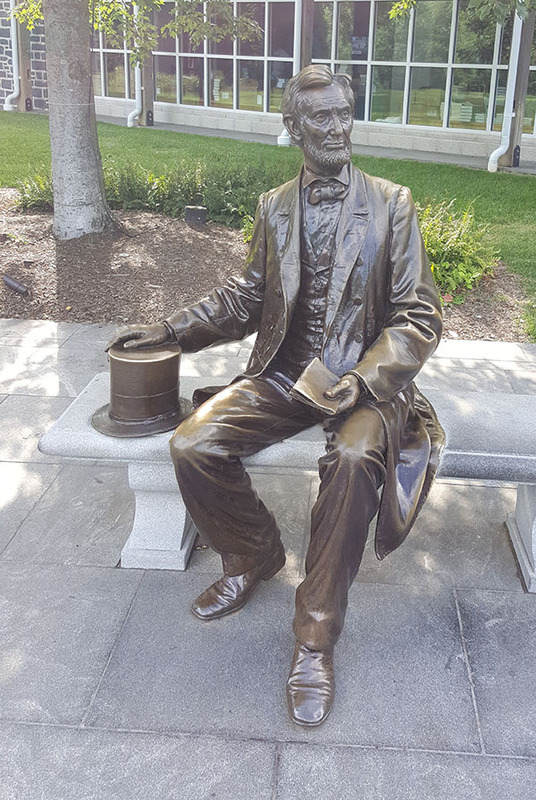 Statue of Abraham Lincoln sitting on a bench, outside the Visitors Center. Monument to the fallen from Virginia, presented by the State of Virginia. There were over a hundred similar monuments in all sizes (this was one of the larger ones). After finishing the auto tour, we had dinner in the bus, walked the dog and set out for our next overnight WalMart. It’s in Hershey, PA. Can you guess what we’re visiting next? The President started the “War of Northern Aggression” (civil war) to prevent the southern states from seceding from the union for violation of their 10th Amendment rights. Slavery never constituted the linchpin of the dispute. Otherwise, the President would have liberated the slaves forthwith, instead of waiting until a year and a half after the war started. That’s an interesting viewpoint, Bob. I admit I held that belief as well for a while, but here’s a pretty convincing contradictory view from a history professor at West Point, courtesy of Prager University.